When the downtown district of Ojai, California gets busy with shoppers, art enthusiasts, spa-goers, and Los Angelenos looking to get out of the city for a few days, the hiking trails scattered in and around Ojai become a popular alternative. The trails allow explorers to escape the hustle and bustle of the town and re-discover a connection with nature. If you’re such an explorer, head to Ojai to fill your schedule with swimming holes, wildflowers, waterfalls, rock formations, an occasional skinny-dipper sighting, and so much more. You could spend a lifetime traversing these trails and not see it all. 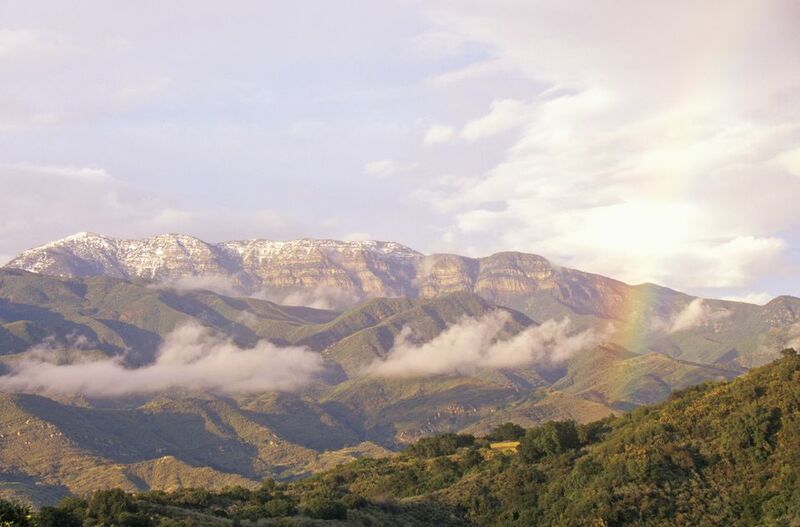 Here are the seven hikes that need to be on your radar next time you don your hiking boots in Ojai. This unpaved trail along the cliffs, offering prime views of the Ojai Valley, is the go-to spot for friends on a “walk and talk” date, trail runners, and parents who want safe and easy terrain to meander with their kids and dogs. This is the only footpath in Ojai that provides regular glimpses of the totality of the valley, so bring your camera. You’ll have ideal setups for panoramic shots at the scenic stops with benches dotting the path. And if all the walking and sightseeing makes you hungry, look out for oranges, tangerines, and avocados that might fall at your feet from the fruit trees lining the way. If you’re walking at a brisk pace, you can get to the end of the trail (Gridley Road) and back in 1 to 1.5 hours. Getting There: Drive to the end of North Signal Street in downtown Ojai and park when the road dead-ends at the trailhead. Gear: The four essentials—hiking shoes, water, snacks, and sunscreen. An offshoot of Shelf Road, this hike attracts those who yearn to feel the burn and become so immersed in nature that the only sounds are their breath, gravel being crunched by their boots, and the occasional sunbathing lizard zipping off a hot rock. Speaking of reptiles… because you’ll be going deep into the mountains, watch out for snakes. The biggest bang for your fitness buck is this trail, hand built by local volunteers, where ascension is the name of the game—at least the first half of the game as you navigate steep switchbacks. If you don’t mind extra weight in your bag, pack a blanket and picnic supplies to enjoy a rest about 1.5 miles up the path near boulders frequented by ambitious rock climbers. Allot three hours for the full loop, more if you stop for a meal, and less if you’re one of those insane folks who run the trail. Getting There: Follow the directions to reach Shelf Road, and when the trail first curves to the right you’ll see a bench and a sign indicating the Fox Canyon Trailhead. When you reach the top of the Fox Canyon trail and spot the marker announcing Foothill Trail, go straight to connect with Pratt Trail that will loop you back around to Signal Street. Difficulty Level: Moderate to Difficult. Unless you plan to spend quite a bit of time so you can stop and rest often, only try this when you are physically fit. While the last half of the loop is downhill, the initial climb could put you through the thigh-burning wringer. Gear: The four essentials, extra water, and a pocketknife—you never know what you might meet in the thorny heart of nature. Hiking takes on a magical and meditative essence on this route. The lack of cell service and huge white rocks jutting out of the ground will keep you in touch with your surroundings. Many hikers have reported spiritual experiences in this terrain, and others find solace during an emotional upheaval while resting on the massive boulders. After walking on a traditional dirt trail for approximately a mile, you’ll have the opportunity to craft your own route as the dirt ends and the white rocks begin. Because your imagination will be required to take over as you navigate the rocks, this hike is both physically and mentally stimulating. You can get to the end of dirt portion of the trail and back in 1.5 hours, but tack on an additional hour if you plan to explore the white geology. Getting There: Drive up the Maricopa Highway (33) into the Los Padres National Forest behind Ojai and turn right at the sign for Rose Valley. Follow the Rose Valley Road until it dead-ends at a large parking area and follow the signs for the Piedra Blanca Trailhead. You’ll cross the wide (and usually very shallow) Sespe Creek and take the route to the left. After .4 miles, turn right at the juncture. Essentially, just walk towards the looming white rocks. Difficulty: Easy to Moderate. The creek crossing can be tedious (depending on how much water is present), so if you don’t feel sure on your feet only do this portion with a companion who can be available to assist you. The rest of the dirt path is mild, and the rocks offer the option of a “stop and smell the roses” stroll, or gnarly boulder climbing—hiker’s choice. Gear: The four essentials, and (if you’re a climber) climbing shoes and chalk. Another Rose Valley favorite, this crisp oasis surrounded by ferns seems better suited for a cartoon movie about woodland fairies than the Mediterranean climate it resides in. Locals in the know have aptly named this spot "the second swimming hole" as it is the second swimmable pool after "the first swimming hole." Because this waterhole sits a mile from the Rose Valley parking lot it weeds out weekenders looking for a spot to drag their coolers or those unwilling to put in extra effort to spot the cairn indicating the trail offshoot, as this swimming hole isn't visible from the main path. While this seclusion excludes those with lots of stuff, it attracts a different breed of nature-enthusiasts: the skinny dippers. It's not uncommon to find a few bare-bottomed Ojai hippies jumping off the rocks surrounding this pool. Expect a 20-30 minute walk (each way) from the parking lot to the swimming hole, then add a few hours for splashing, diving, and sun worshipping. Getting There: Follow the same trail from the Rose Valley parking lot that you would for Piedra Blanca, then turn right soon after the Sespe Creek crossing, where Piedra Blanca goers would turn left. The cairn marking the trail to the water is about .5 miles up the path on your right. Difficulty: Easy to Moderate. You’ll have to cross the same creek that you'll see on the Piedra Blanca hike, but after that, the most challenging aspect of this trek is finding the cairn; if you see the water-loving cottonwood trees that surround the water you’re heading in the right direction. Gear: The four essentials, bathing suits, and towels. This is a favorite after-school hangout for teens, and parents needing to go somewhere easy to let their tots get some energy out. After a few good rains, this trail ends in a swimming hole where it’s common to see kids leaping off boulders into frigid water and families with coolers. This is a great choice for those that consider themselves more recreational walkers than hard-core hikers. Because of the accessibility of this path, you’ll likely have many opportunities to commune with Ojai locals and get to know the spirit of the people while you connect with the spirit of the land. Expect the walk to take 15-20 minutes, each way. Getting There: Park in the lot for The Riverview Trailhead located on Rice Road, just South of El Roblar. Follow the trail until you hit the water, or a dry creek bed (that’s still fun to explore). Difficulty: Easy. Beyond the initial descent from the parking lot, this hike is simple. But, if you find water, be wary of slick rocks. Gear: The four essentials, bathing suits, towels, and bug spray. On this lightly trafficked trail (at least on weekdays), you’ll find an abundance of silence and wildlife sightings. Cozy Dell’s proximity to downtown Ojai makes it a prime choice for an early morning hike before returning to town and dipping into the diverse cultural offerings. The wildflowers, tall grass, and mountain views laced into this walk seem to evoke a timeless essence that makes even the most harried amongst us slow down and take in the awesome power of our natural environment. The 3.6-mile loop is commonly done in two hours. Getting There: Take the Maricopa Highway (33) 3.3 miles North of Ojai and park in a turnout on the left side of the road near the Friends Ranch Packing House. Difficulty: Moderate. While this hike is fairly quick, you’re walking uphill for at least half of the walk.